The people of Nagaland are demanding for Nagalim i.e. Greater Nagaland. Their demand is very complex because the Naga tribe is dispersed all across the North East states. The people pf Nagaland demand for a separate, sovereign state for all the Naga invaded areas in the North East. In 1918, the Naga movement started with the formation of the Naga Club by 20 Naga members. These members had served in the World War I and this aroused a feeling of nationalism amongst them which shaped the idea of a Naga Nation. The Naga Club submitted a memorandum to the Simon Commission in 1929 which demanded a separate, autonomous state for the Nagas. Subsequently in 1946, Dr. Phizo, a Naga nationalist leader, popularly known as the “Father of the Nagas” formed Naga National Council. In 1947, the Akbar Hydari Agreement was signed between the then Governor of Assam and the Naga National Council but it eventually failed. In 1952, Dr. Phizo formed the NFA (Naga Federal Army) and the NFG (Naga Federal Government) to start an armed move. The NNC involved in violent activities which forced the Indian security forces to come up with counter insurgency operations. The government of India enacted the AFSPA (Armed Forces Special Powers Act) in 1958 to tackle the insurgency problems in Nagaland. Due to the continued insurgency, the Shillong accord was signed in 1975 in which the NNC agreed to give up violence. The government got a section of NSC leaders to sign the Shillong Accord but a group of about 140 members who were at that time in China refused to accept the Accord and formed the NSCN (National Socialist Council of Nagaland) in 1980. The NSCN split into two divisions in 1988- NSCN (I-M) (National Socialist Council of Nagaland- Isaac Muivah) and NSCN (K). The NSCN (I-M) faction led by Isak Chishi Swu and Thuingaleng Muivah, believes in talks with the government regarding the formation of the separate Naga Nation. The other Khaplang faction, headed by S.S Khaplang reside out of India and are responsible for violent bombings. Eventually the NSCN (I-M) was seen as the mother if all insurgencies in that region. The NSCN (I-M) signed an agreement with the government of India in 2015 to solve the problems. The Government of India and the NSCN signed a historic peace accord, thus bringing an end to one of India’s oldest insurgencies. Naga interlocutor Mr. R. N Ravi, on behalf of the Union Government, signed a framework agreement with the NSCN (I-M) to end the Naga insurgency. There are six insurgency groups in that region. NSCN (I-M) has been fighting for Greater Nagaland or Nagalim to extend Nagaland’s borders by including Naga dominated areas in Assam, Manipur, Arunachal Pradesh to unite the 1.2 million Nagas. But these countries refused to make a peace deal. 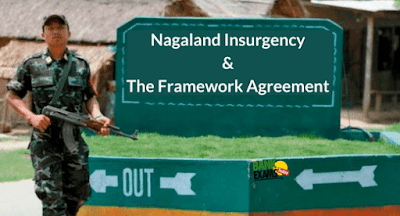 The Naga framework agreement was signed in 2015 at the Prime Minister’s residence. But the Centre has not yet revealed the details of the agreement. This is because there has been a decade long insurgency in the North East region. So if the government tries to pacify one insurgent group, it would offend the other groups thus preventing from arriving to a consensus. If the details of the deal were made public, it would lead to increase in tensions between the insurgent groups. NSCN (I-M) was the most dominant insurgent group so it was important to sign an agreement with them for the restoration of peace and security in Nagaland. It stands for Armed Forces Special Powers Act. It came into being in 1958. Nagaland was the first state in India in which AFSPA was implemented top tackle the problems of insurgency. AFSPA is applied to the disturbed areas which can be defined by both the centre and the states. Disturbed areas are where the local administration (police) fails to control the situation and CAPF (Central Armed Police Force) is required. In India, six particular forces are called as CAPF which include CRPF, CISF, BSF, ITBP, NSG and SSP. a) They are allowed to capture, arrest, seize without warrant and they can even use the force. b) They have the power to open a fire arm even against the people without arms and ammunitions. c) They can open fire to an assembly of five or more than five people. d) Section 6 with respect to accountability of misuse of power states that no proceedings can be initiated against the alleged commission of crime without the permission of the Central Government. It has been observed that there has been blatant misuse of power ranging from atrocities, human rights violations, killing of innocent people etc. The court cannot start the proceedings without the permission of the Central Government. a) Disturbed areas- There are no particular specifications as to which areas would be considered as disturbed areas. Therefore one can fulfil its selfish aims and implement AFSPA in some particular area according to one’s wish. b) Special powers- Power given to capture, seize without any warrant. c) Implementation- The implementation of AFSPA is a kind of a conflict between the Centre and the state. Recently Supreme Court tagged it as an extra judicial killing which is not a mandate of AFSPA. ARC-II (Administrative Reforms Commission) recommended that talks should be held to improve the implementation of AFSPA as human rights violations is being done and there is no accountability. Justice Jeevan Reddy committee was formed for AFSPA which recommended the repeal of the AFSPA because it caused more harm than benefit. AFSPA has been implemented so many times in Kashmir that it has created a trust deficit there.